Promoter Ged Rathbone insists Panthers are ‘serious people’ in the race for Premier League honours. The city side stormed to the top of the second tier after pulling off two terrific victories on a busy Bank Holiday Monday. They captured all seven league points available on the day by roaring to a 53-40 triumph at bottom side Scunthorpe before thumping another set of strugglers, Ipswich, 56-36 in an East of England Showground thriller. It sent them four points clear of Glasgow, Somerset and Sheffield who have all ridden fewer meetings than Panthers. Those sides also all ride again before the city men are back in action when entertaining Glasgow next Friday (June 10). But Rathbone is still upbeat about his side’s prospects. He said: “It feels fantastic to be top of the table and the challenge now is making sure we stay there. “We know we’ve ridden more meetings than any other team in the league, but we’re also very confident in the strength of our team. “Picking up seven points on one day is a great effort and it shows that we are serious people who are here to win speedway meetings. Rathbone believes the arrival of Czech talent Zdenek Holub will only aid Panthers’ hopes of title success. The 20 year-old has been drafted in to take over a reserve berth from local lad Tom Stokes, who has been replaced after completing just one meeting. Holub has brief Premier League experience with Scunthorpe late last season and in the early weeks of this term and races on a 3.09 average, although Panthers bosses had to complete his signing on Tuesday when his figure was still at 3.00 to ensure he could fit into their side. Rathbone added: “The opportunity to bring Zdenek in was one we could not miss – and we had to move very quickly to be able to do it. “We needed the British Speedway Promoters’ Association (BSPA) to approve our new team declaration on Tuesday, which they did, as his average rose slightly the following day. Holub will make his debut against Glasgow next Friday while Panthers have also added a home clash against Scunthorpe a few days later on Tuesday, June 14. 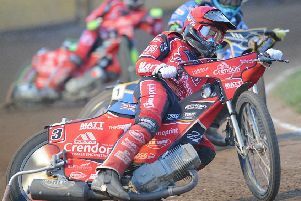 The currently injured Tom Perry still classes as Panthers’ compulsory British rider after starting the season at reserve on a three-point average. Rathbone confirmed the club will continue to work with Stokes on his development as a rider. Panthers captain Ulrich Ostergaard races in the Danish Final tomorrow night (Friday).